During the weekend the companies of Modena will be the protagonists of “Fa la cosa giusta!“, an exceptional exhibition at the Milan fair. From 23rd to 25th March 2018 do the right thing! This year the national edition of “Fa la cosa giusta!”, the fair of mindful consumption and sustainable lifestyles, celebrates its 15th birthday. To celebrate this milestone, the entry will be free for all visitors. The 2017 edition closed with 70,000 visitors, 700 exhibitors and 400 events in the cultural program, 550 accredited journalists, and 2800 students participating in the “school project”. Do the right thing! The 2018 edition of the “Fa la cosa giusta!” will consist of 10 thematic areas, which will give space to well known issues such as ethical fashion and sustainable furniture, as well to emerging ones such as the vegan and cruelty free choice and the them of conscious consumption. The fair will consist of 32 thousand square meters of exhibition area, integrated by a rich cultural program with meetings, workshops and practical demonstrations. Even the province of Modena will participate to “Fa la cosa giusta!” with some supportive proposals. To start with, in the ethical Fashion area, there will be the the Medulla screen-printing laboratory. The company deals with fabric printing and concept-design processing for clothing lines. Medulla has developed a completely natural silk-screen color with zero-impact, to replace the standard screen printing lacquers. Here two events organized by Medulla: Sunday, March 25 at 17.00 the company will organize a demonstration of screen printing with natural pigments, while in the workshop “From seed to print” the participants will have the chance to realize, during the three days, a screen printing on paper with colors derived from plant extracts. Finally, another proposal is that of the of the Random – Upcycling Ethic Couture of Castelvetro which focuses on creative recycling; this ethical and responsible fashion brand will propose garments in the Critical Fashion section. These garments are crafted by hand with waste clothes, cut out and recomposed in a new shape to obtain a higher aesthetic and functional value. Their website also offers the chance to design a copletely upcycling dress according to one’s taste. Previous A Balsamic Vinegar beer: a winning one! Next A personal Balsamic Vinegar worth of competition! 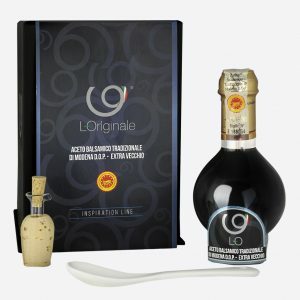 What is Balsamic Vinegar? Take a look. Olive Oil and Balsamic Vinegar: the best of the Italian tradition.